The inner structure principle of tight cable seal is very simple. The one end of seal belt is fixed at lock body, and the other end of seal belt connects with lock head. Deep hole is in the seal body, two inclined holes are connected with deep hole. There is spring inside of inclined hole. There is steel ball between each inclined hole and deep hole. Steel ball is supported by corresponding spring. Two grooves are in lock head correspondingly with two steel balls, which formulate chamfer at the front of two steps of the first groove. 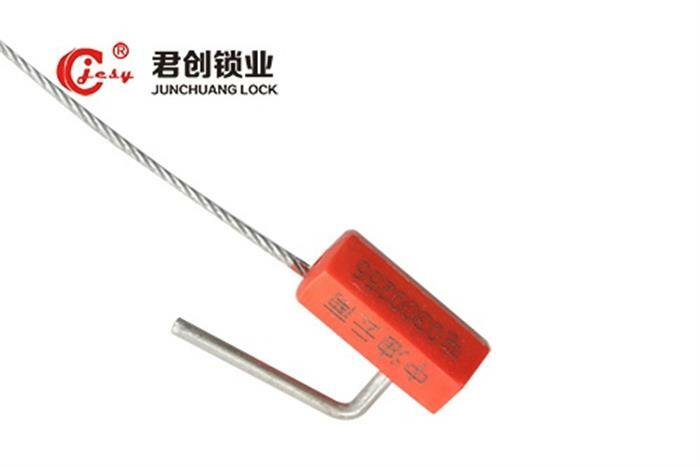 When using, lock head into hole of lock body, two steel balls respectively enter into two grooves of lock head, two steel balls are respectively pressed at two grooves under the function of spring, fix head, and then sealed. Through the cooperation of two steel balls and two grooves at head, head is fixed solidly. Cable seal is applied widely, e.g. trucks, containers, vans. Different from other normal seals in structure and material, it is impossible to duplicate the illegal persons, which can bring huge economic effect to public enterprise companies.